Crab pricing varies daily. Supply and demand are the biggest factors affecting the price and these are mostly outside of our control. But there are some pricing factors that you can control. Our commercial crabbers typically harvest blue claw crabs in smaller quantities, often in response to specific orders or expected demand. We sell live ‘swimming crabs’ at the marina in a tank individually. Crabs are then bagged or boxed for live transport. Marina members may use on-site equipment to cook and clean their crabs but most transport them live. Call or text with the quantity and date needed to 856-237-9199. We will respond with an electric invoice. Price quote is good for 30 minutes. We will confirm receipt of payment and confirm the order. Once paid, the order is confirmed and you are protected from any price change. We offer delivery when a driver is available at approximately the same rate as Uber. We will cost-match the lowest cost current option. An online calculator of delivery cost is available here. 2) pickup or delivery details (time and location). Most people plan to serve 3 to 6 crabs per person. Your guests may be different but this is our experience in hosting dozens of crab dinners for a variety of groups of dinner guests. Crabs are traditionally graded numerically (#1s, 2s, 3s). We do not use that system because that grading varies between sellers and locations and even recently changed here in the local commercial crab market. In other words, the term “#1s” doesn’t have any precise or widely agreed upon meaning so it has limited value to crab buyers. Crabs are traditionally packed and sold in bushel baskets. We do not use this method but will accommodate a customer request for a bushel basket. (We do sell crab baskets, new or used, with or without crabs). If you buy a bushel of crabs from anyone, be aware that it includes some dead crabs. The industry standard is up to 20% dead crabs. We only sell live crabs as required by food safety laws but is is common for crab customers to hire an independent local dock worker to clean crabs in exchange for a tip. We can usually help make this connection on request but the details of the arrangement are up to you. Cleaned crabs should be kept on ice or refrigerated. 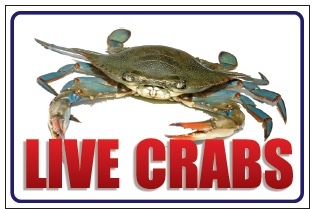 We often offer special daily deals on mixed sized crabs or unsold quantities at he marina. In most cases the price remains the same but the offer includes an extra number of crabs. Those deals are posted on social media and are valid only until those specific daily crabs are sold on that day. These deals are short-lived, sometimes as short as 30 minutes before unsold crabs must be shipped to a wholesale dealer.